Ottawa was proud to host this year's One Young World conference for 2016, and Bloomex was delighted to be part of this prestigious international event! This important international symposium hosted approximately 1300 delegates who represent some of the brightest young leaders from around the world. They gather to make lasting connections, to foster positive changes, and formulate innovative solutions for a variety of pressing global issues. The Summit is also host to some of the best business minds from top global companies, as well as from leading universities . One Young World Summit is also a host to a line-up of very well known world leaders who act as Counsellors. Past year's Counsellors have included famous faces such as Archbishop Emeritus Desmond Tutu, Sir Bob Geldof, Kofi Anan, Sir Richard Branson, Jamie Oliver, Jack Dorsey and Arianna Huffington. 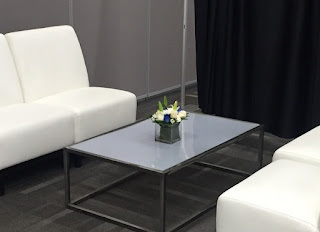 This year's event was held at the Shaw Centre in beautiful downtown Ottawa. Prime Minister Justin Trudeau conducted the opening ceremony at Parliament Hill and urged the young delegates to "create a future that we will all be proud of." Singer songwriter Cher was on hand to launch her new campaign to help animals in captivity. Actress Emma Watson was another of the very special guests. 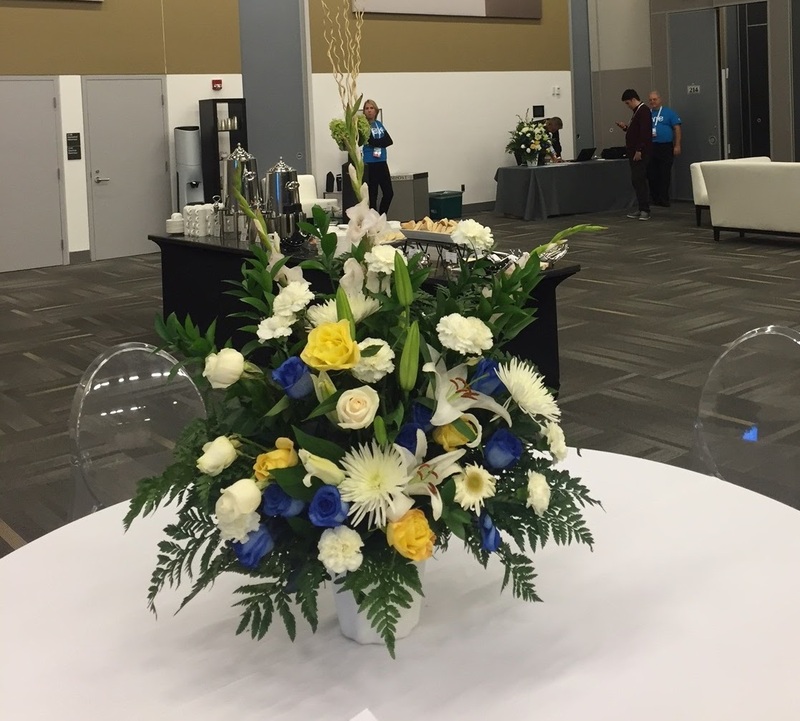 The event itself was organized by internationally renowned event planning company George P. Johnson, who were tasked with creating a VIP lounge where delegates, counsellors and special guests could work or relax. Bloomex was delighted to provide all the flowers for this beautiful space! The organizers wanted florals to coordinate with the OYW logo, that would accent the work tables, the entry and the lounge area. 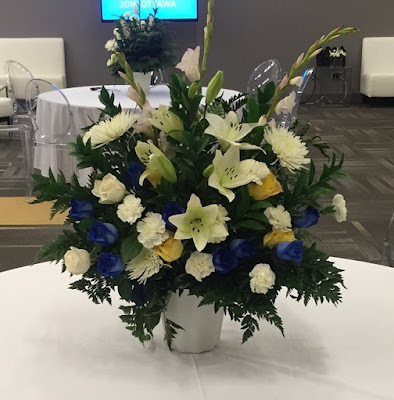 The Bloomex Ottawa team created some gorgeous florals in blue and white with yellow accents, including large sprays, table centrepieces and modern cube accent bouquets for the lower cocktail tables. Flowers consisted primarily of white, yellow and blue roses, white lilies, white spider mums, white carnations, gladiolas, with accent greens such as ruscus, aspidistra, ferns, and eucalyptus. Guests enjoyed the very pretty floral touches as they relaxed and mingled in the lounge space. The modern cube vases provided the perfect decorative touch for the low tables without occupying too much of the available space for drinks and snacks as guests interacted. The spectacular four-day event concluded with speeches and an exhilarating display of Colombian music, dance and culture in tribute to next year's hosts. One Young World 2017 takes place in Bogata and should be another wonderful success. Bloomex was very proud to be part of the Canadian hosting for 2016 which helps promote our beautiful county as well as our lovely capital city. Click here to read more about One Young World.